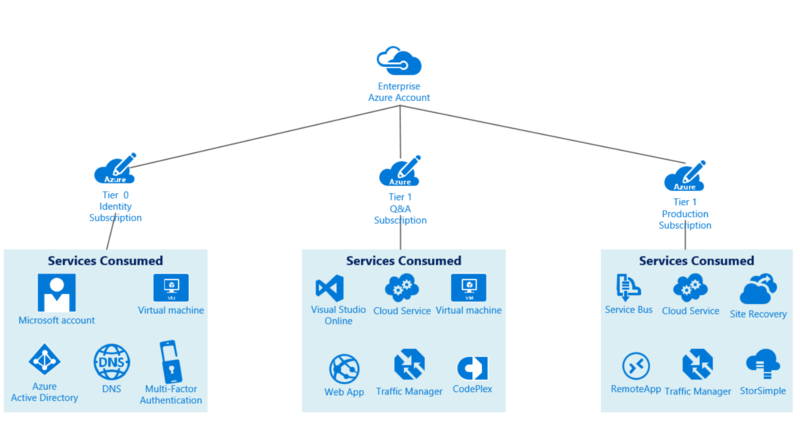 But if you need to deploy Azure in an enterprise with different teams, locations, etc it might get more complicated and you will need different subscriptions. 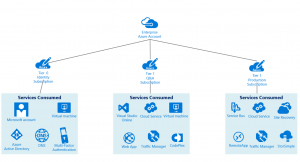 This blog post will cover some of the Azure subscription best practices to keep in mind. At first a subscription was the administrative security boundary of Azure. Let’s say you had a HR team and a marketing team and no administrative overlap is allowed you would have to create two subscriptions. 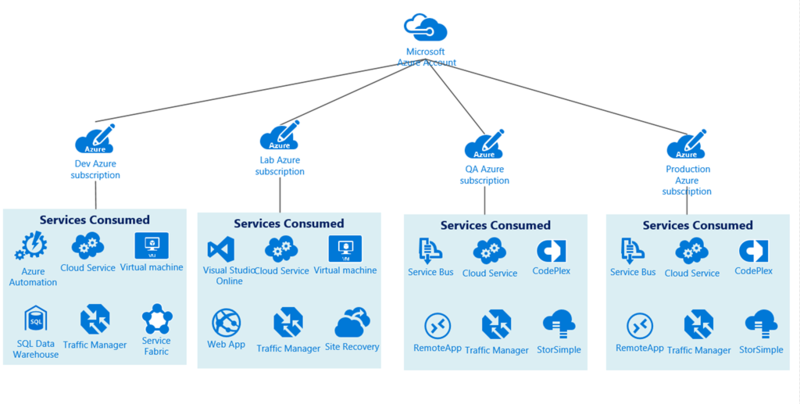 Now with the Azure Resource Management (ARM) model this is not longer the case as the subscription is no longer needed as an administrative boundary. ARM provides a more granular Role-Based Access Control (RBAC) model for assigning administrative privileges at the resource level. RBAC is generally available now with 29 new roles available at this time. For a full list of RBAC roles have a look here https://azure.microsoft.com/en-us/documentation/articles/role-based-access-built-in-roles/ . A subscription forms the billing unit. What you have consumed from Azure within a subscription will be counted towards the Subscription bill. A subscription also has a logical limit of scale of resources that can be allocated. There is a default limit for example of 6 SQL database servers and max 150 per subscription. Many of these soft limits can be increased greatly by simply creating a support request, but some of the hard limits have a big impact on decisions regarding subscription design. Not all limit usages are visible in the Azure portal but you can use Get-SubscriptionLimit PowerShell script that you can find here Services Automation Repository. You can find the full list of limits here https://azure.microsoft.com/en-us/documentation/articles/azure-subscription-service-limits/ . Scalability and capacity planning are a key element when designing a subscription strategy. Following is an example subscription design based on a subscription per Organizational Unit. Here is another example subscription design that is based on one subscription per environment in the development process of an application. 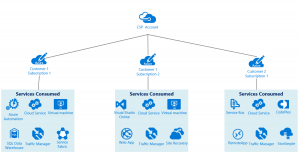 For CSP-managed scenarios, here is an example subscription design that illustrates a model for one or more subscription per specific customer where a separate service deployment for a given customer may be assigned a dedicated subscription. In this example we have multiple subscriptions, a tier 0 subscription for everything related to identity and authentication, a tier 1 for the Q&A environment and another tier 1 for the production environment. This will ensure that no change on the Q&A and production environment will have an impact on the identity and authentication environment and although the identity is in a separate subscription it will still be able to offer domain authentication services to the other subscriptions and virtual machines. This model will scale based on needs. If you ever need to add another Q&A ennvironment or another production environment in another Azure region it’s perfectly possible. Connectivity and networking is really a key component when defining you subscription strategy. A virtual network needs to reside inside a subscription. A network can be a shared resouce inside an organization but that’s not always the case for a subscription. Because a virtual network exists inside a subscription you also need to consider the limitations. You can for example only have 50 virtual networks per subscription, 10 express routes per subscriptions and 10 virtual networks per express routes. So if you are using 2 express routes you can only have 20 virtual networks in one subscription. Keep in mind that if multiple virtual networks are using the same expressroute there is no network isolation. If network isolation is important to you, you should use Network Security groups to separate the traffic. 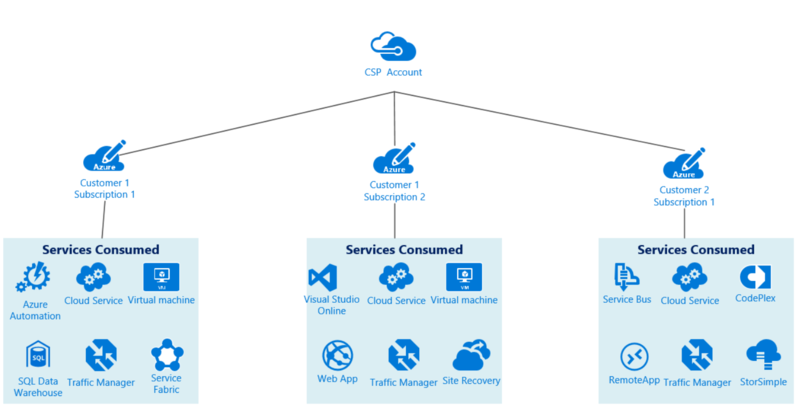 A subscription is a logical boundary and grouping of Azure services and administration. Subscription administrators can provision, start and stop and delete Azure services. They can remove, add, read, write and download anything from the Azure storage account. They can grant administrative access to new users as well. So a subscription administrator is a really powerfull role and you need to think carefully for the people you assign this role. You can compare it to an Active Directory domain administrator. Is the subscription owned by the customer or managed by a cloud service provider? Is an Office 365 Azure Active Directory tenant set up? Are there plans for Office 365 enrollment? Are there other Azure subscriptions in use? Have you deployed a trial Azure subscription? Have you run a trial Power BI evaluation? Have you run a RMS evaluation? Can you use the desired OrgID *.onmicrosoft.com for company directory? As ex plained above a subscription has his limits in respect to the number of VMs you can run, virtual networks you can have, storage, etc. What are the growth plans? How will limited resources be allocated? How will the model evolve over time considering additional users, shared access, and resource limits? When defining a naming convention for the subscriptions try to be as clear and meaningfull as possible. many organizations will have more than one subscription so you need to define a naming convention and be consistent. Which translates into: “Company” “Department” “Product line” “Environment”. This of course is just an example, the most important point here to remember is to define a naming convention that is meaningfull to the company. Previous Article System Center Universe Asia Pacific is coming! Next Article New step in my career…. down under!